GROUND ZERO: Is regional protection an option? 14 September 2016: There is a trio in the Atlantic! Yesterday morning residents of Southeast Florida woke-up to find a dark sky and a wall of storm clouds covering the eastern horizon, rather than the bright orange, red and yellows signaling the sunrise in paradise. Satellite images revealed this bleak panorama was the view along the full length of Florida’s east coast as one of the tropical waves we’ve been monitoring over the weekend had crept close to shore, and appeared to be strengthening and getting better organized as the day progressed. This tropical wave actually moved inland near Daytona generating copious rain over central and northern Florida, and all over offshore waters all the way into Georgia and the Carolinas. Gusty winds, rain and thunderstorms were the norm for most of northeastern Florida by nightfall yesterday. Further observations and additional data continue to show the potential for cyclonic development, suggesting Tropical Storm JULIA was about to develop around 10:00 P.M. last night. Sure enough, the 11:00 P.M. advisory from the National Hurricane Center confirmed Tropical Storm Julia was active over northeastern Florida. 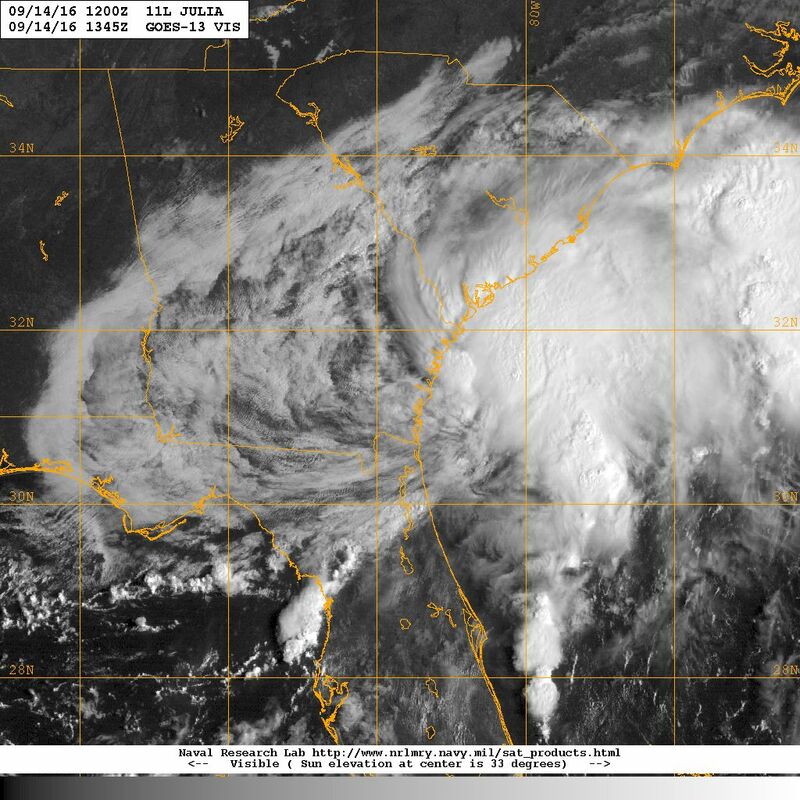 Satellite image of 14 September 2016 showing tropical storm JULIA, in visible light, nearing Savannah, Georgia, while it generated copious rain over a large region and offshore waters. 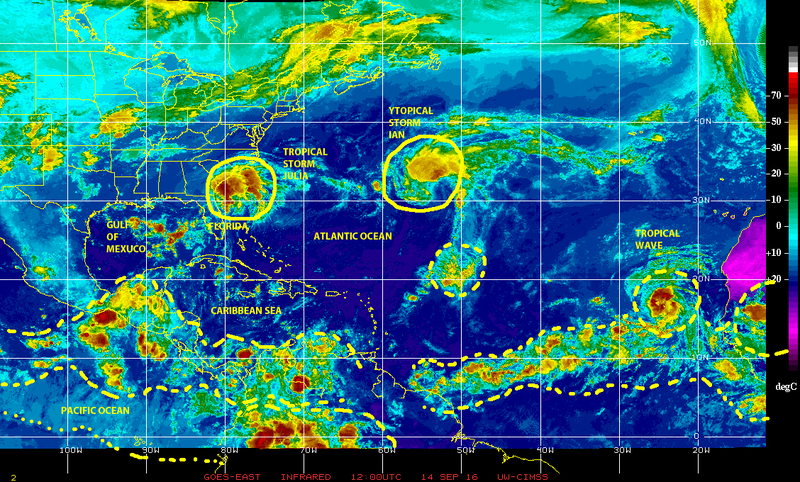 This morning, 14 September 2016, we have a trio of storms active over the north Atlantic basin. Tropical storm JULIA, the tenth-named tropical cyclone of the 2016 Atlantic Hurricane season, moving inland toward Savannah, Georgia, joins Tropical Storm IAN now tracking NE over the central Atlantic. Farther to the south and east a large tropical wave over the Cape Verde Islands appears to be growing stronger and better organized, showing clear cyclonic tendencies, while it is being investigated by the National Hurricane Center for possible further development. Analysis of recent satellite imagery suggest we may already have a tropical depression over the Cape Verdes, the ‘seed’ for yet another tropical cyclone in the Atlantic basin. All interests around the basin need to monitor this one closely, as well as tropical waves over Equatorial Africa as we have already entered what historically is the peak of the annual Atlantic hurricane season. Elsewhere, a compact hurricane ORLENE is moving away from Mexico toward the Central Pacific. Farther west, Super-typhoon MERANTI is approaching landfall in China, a strengthening typhoon MALAKAS is near the Philippines making a turn to the NW that will bring it near Taiwan, while several strong and potentially cyclonic tropical waves populate the waters between the Central Pacific and the Philippines Sea. There is plenty of fuel for potential tropical cyclone development in that region over the next few days. While the northern hemisphere tropics boil with activity,we must all remain alert. Be prepared. MITIGATE! Worldwide composite satellite view showing all active tropical cyclones on 21 September 2010. Today 21 September 2010 the worldwide tropics and extra-tropical regions are populated by a veritable menagerie of tropical cyclones. Hurricane IGOR continues to move north near Newfoundland, Canada with sustained winds of 80+ mph, it would appear Igor is planning a visit to the Arctic regions to the west of Greenland in what might be a ‘first’ since records have been kept. In the mid-north Atlantic near the Azores the remnants of Tropical Storm JULIA continue to generate rain as the system moves toward the northeast. To the west of the Cape Verde Islands and moving north by northwest there is tropical storm LISA with sustained 45 mph winds, which is forecast to continue moving generally toward the northwest over the open waters of the Atlantic. Color-enhanced infrared GOES satellite view showing the very large tropical wave extending more than 1,100 miles from the eastern Caribbean to the Atlantic's Hurricane alley as it straddles over the Lesser Antilles on 21 September 2010. This system is moving westward and it is showing signs of getting stronger and better organized with high potential for additional development in the next 24 - 48 hours. A lot closer to our neck-of-the-woods a huge tropical wave more than 1,100 miles long straddles over the Lesser Antilles as it moves westward into the eastern Caribbean. This system is generating copious rain from northern Venezuela to Hispaniola. Given its size and favorable atmospheric-ocean environment ahead, this system should be closely monitored by interests in the Caribbean, Central America, Mexico, and beyond that in Florida and the Gulf. 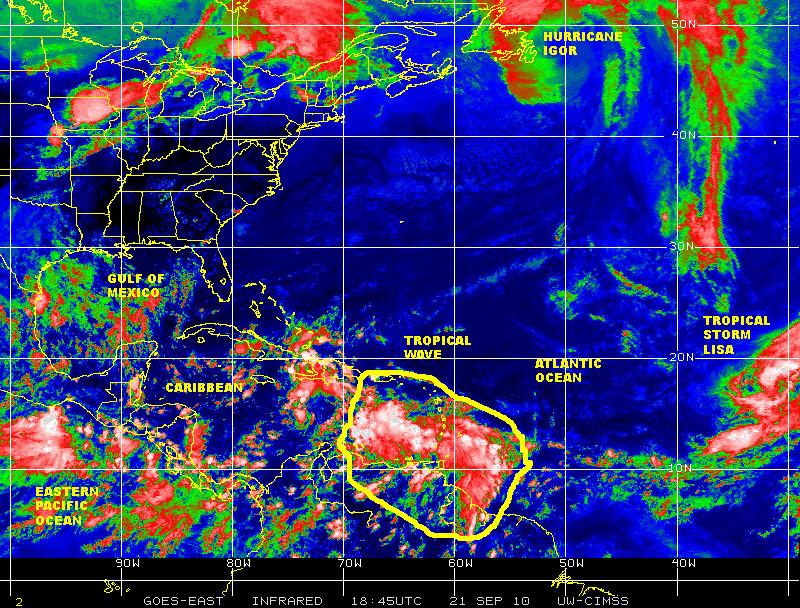 This tropical wave has been growing better organized and stronger during the day today. To balance things out with all the ongoing activity in the larger Atlantic basin, there is Tropical Storm GEORGETTE in the eastern Pacific south of Baja California, tracking generally north toward La Paz. At the other extreme, in the western Pacific, in a region that has been quite active this season there is Tropical Storm MALAKAS tracking toward the northwest and projected to re-curb north and then toward the northeast over the open waters of the northwestern Pacific ocean. Moving “in the sidelines” no fewer than eight tropical waves or cells of disturbed weather span from the west coast of equatorial Africa to the east coast and on to the shores of Indonesia in the Indian ocean; any of these tropical waves, given the right combination of factors and a favorable atmospheric environment, may have the capability for generating a tropical cyclone over the next couple of weeks. Certainly food for thought as the 2010 Atlantic hurricane season continues. Composite satellite view showing active cyclones and tropical waves from the eastern Pacific through the Caribbean and Hurricane Alley, to Africa and the Indian Ocean beyond on 21 September 2010. Plenty of fuel for tropical cyclones for the next couple of weeks. # 14 IS HERE! A DELUGE IN NICARAGUA! Tropical cyclone activity continues worldwide! FLORENCE AND COMPANY ARE ON THE MOVE! HURRICANE SEASON 2018: THE ATLANTIC WAKES UP! Ricardo on It is mostly quiet in the northern front!